After taking Ibiza by storm this summer, Hot Creations brought their Ibiza party to London for a special Paradise event at Brixton’s O2 Academy on April 13. This in-demand event featured the live debut of Hot Natured, the collective of Jamie Jones, Lee Foss, Luca C and Ali Love. Latest single ‘Benediction’ has become one of this year’s biggest dance tunes, and their debut album and live shows are set to be one of the significant stories in electronic music in 2013. DJ support came from Jamie Jones, Lee Foss, Richy Ahmed, Infinity Ink and PBR Street Gang. 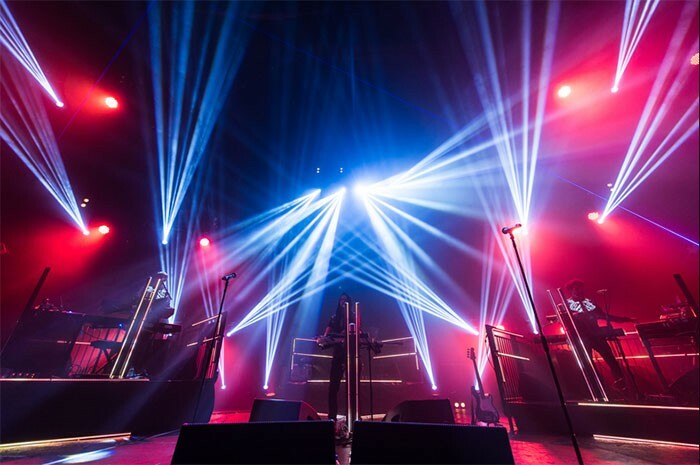 PRG’s Andrew Strachan worked alongside Ben Pound, director of Futureline Events to supply lighting, media server and creative LED. Gregory Douglas was overall project manager and Chris Scott was crew chief. Cameron Bannister worked with Andy and Ben to design a complex array of 50 x 1500mm and 12 x 375mm MiSTRIP in to the stage set. These were pixel mapped and video content delivered from a Hippotizer media server to provide some really stunning dynamic effects. Harry Forster programmed and operated the lights and media server with a grandMA full-size and also pre-programmed the show in PRG’s WYSIWYG suite at East Molesey. Working alongside Ben, Andy supplied and designed the lighting and truss layout. PRG supplied a selection of VL2000s spots / GS Beams / GLP impressions and Atomic Strobes.